An enemy formation in Pleasant Path. 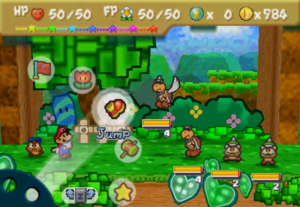 In Mario's adventure in Paper Mario, he will encounter enemies on the field. When he engages battle with them, there are often other enemies that accompany the one that Mario encountered on the field. The lists will show the following: the location; the area or room the enemy/boss can be found; the enemy/boss encountered on the field; and the enemies accompanying it, listed in order from the first enemy in the front to the last enemy in the back. Names of areas/rooms of a location listed on these charts are conjectural. Excluding Dry Dry Desert and Forever Forest, enemies on field per area/room are listed by the "order" they're encountered. Enemies with an asterisk (*) are those that are mini-bosses, bosses, support enemies for a boss, or those that must be fought to drop items they're carrying. Jr. Troopa encounters Mario in the first area of Pleasant Path after the player clears Chapter 1. No enemies will appear in this area until he is defeated. Kent C. Koopa appears in the same area in Pleasant Path as Jr. Troopa after the player clears Chapter 5. The Fuzzies in Koopa Village disappear when a group of them is defeated in the backwoods. All Bullet Bills fired from the Bill Blasters have the same formation. As mini-bosses, the Bill Blasters in the Koopa Bros. Fortress disappear when they're destroyed. Jr. Troopa encounters Mario in Forever Forest after he obtains the Super Boots. The Clubbas in Tubba Blubba's Castle disappear after the player clears Chapter 3. A lone Goomba or a pair of Clubbas are created by Kammy Koopa in the Blue Zone if Princess Peach chooses either enemies in the first question Bowser asks her during the Chapter 3 intermission. A group of four Fuzzies or a lone Hammer Bro are created in the Pink Zone if Peach chooses these enemies from Bowser's second question. Two Pokeys or two Koopatrols are created in the Green Zone if Peach chooses these enemies from Bowser's last question. The yellow Shy Guy carrying the Note in the area east of the Green Station disappears after Mario defeats it and collects the Note. The three Jungle Fuzzies in Lavalava Island's shore appear as soon as the Fearsome 5 become missing. The lone Crazee Dayzee in the patch of flowers in the southeastern area of Flower Fields may be replaced with an Amazy Dayzee. All Spinies deployed from Lakitus have the same formation. Jr. Troopa encounters Mario in the first area of Shiver Snowfield -- no enemies appear in this area until the player clears Chapter 7. For this reason, the two Gulpits in this area do not appear until then. All Bombshell Bills fired from Bombshell Bill Blasters have the same formation. If the player answers three questions wrong at the second Bowser Door, they face the Anti Guys Unit. This page was last edited on February 16, 2019, at 22:50.